Grace Cathedral, up on the heights of Nob Hill above downtown San Francisco, is an uplifting space. 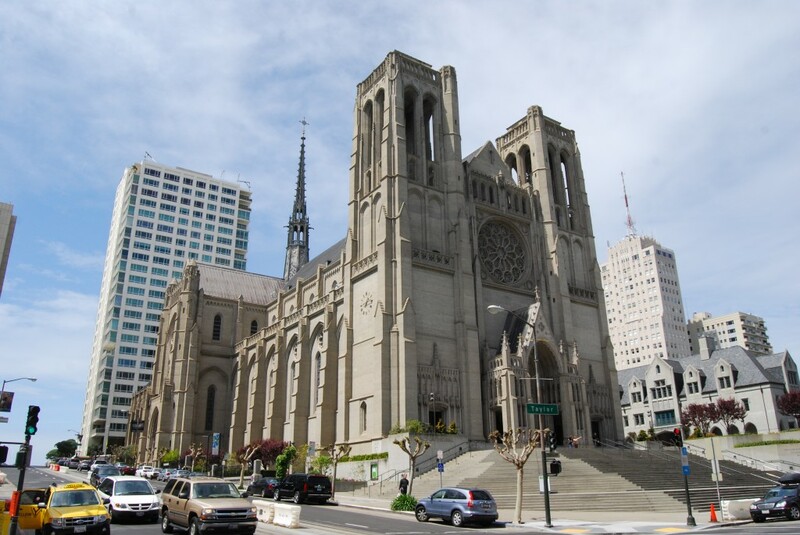 It’s a pure thirteenth-century Gothic cathedral, built of concrete between 1928 and 1964 to the designs of Lewis Parsons Hobart (1873-1954) to replace a predecessor destroyed in the 1906 earthquake. Hobart’s wife was a cousin of William H Crocker, the donor of the site. In the tradition of much older churches, the interior of Grace Cathedral is an essay and a narrative, with murals by Jan Henryk De Rosen, and stained glass by Charles Connick of Boston and Gabriel Loire of Chartres, two of the greatest stained-glass designers of the twentieth century. The bronze Ghiberti west doors are the reproductions that the Nazis made of the Florentine originals which they removed during the Second World War. The 44-bell carillon in the north tower was built by Gillett & Johnston of Croydon, and donated by a Methodist dentist from Penzance, Nathaniel T Coulson: it was first played in 1940. It’s a beautiful building to visit – light, spacious, peaceful, welcoming. The glass tints the interior blue, Gabriel Loire’s preferred colour because, he said, “La paix donne la joie.” (Peace gives joy.) There are two labyrinths, one on the forecourt and the other at the west end of the nave – mysterious aids to meditation based on the medieval original at Chartres. There’s something curiously Californian about this inclusive, relaxed place that takes itself seriously with delicacy. The Grace Cathedral website is at http://www.gracecathedral.org. This entry was posted in Exploring California, Sacred Places, Survivals & Revivals: past views of English architecture on December 31, 2013 by Mike Higginbottom. 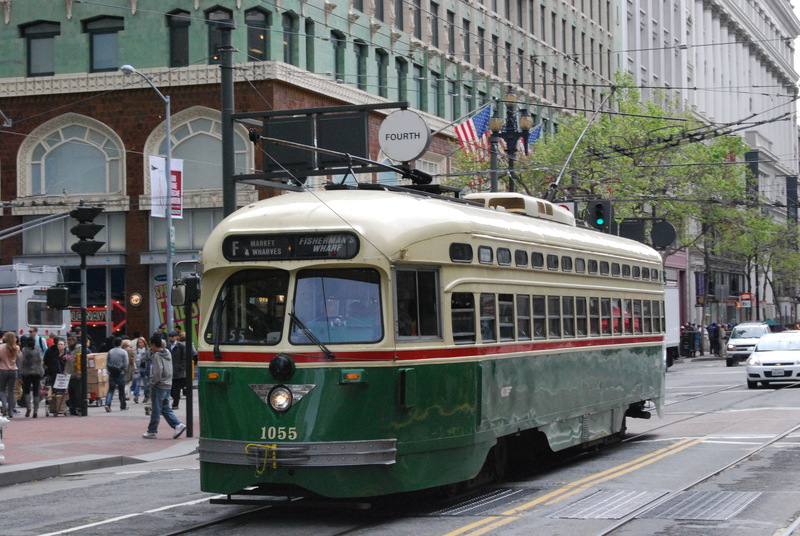 San Francisco’s historic streetcars, which ply between Castro and Fisherman’s Wharf along Market Street and the Embarcadero, are an ironic survival. Most San Francisco streetcar lines gave place to trolleybuses and motor buses after the Second World War. A small number of routes survived because they used tunnels that couldn’t be adapted to non-guided vehicles. By 1982 the transport authority, Muni, converted the remaining streetcar routes to light-rail and built a twin-level subway along Market Street with light-rail on the upper deck and the inter-bay, heavy-rail BART line below. In that same year, the utterly worn-out cable-car system shut down for complete rebuilding over a two-year period. In an attempt to maintain tourist interest, Muni, in conjunction with the San Francisco Chamber of Commerce, ran some of the surviving streetcars along the Market Street surface tracks as a summertime tourist attraction. These Historic Trolley Festivals were so successful that they were retained after the cable-cars returned in 1984, and from 1987 the Market Street lines were relaid and a fresh fleet bought second-hand from Philadelphia and Newark, New Jersey. 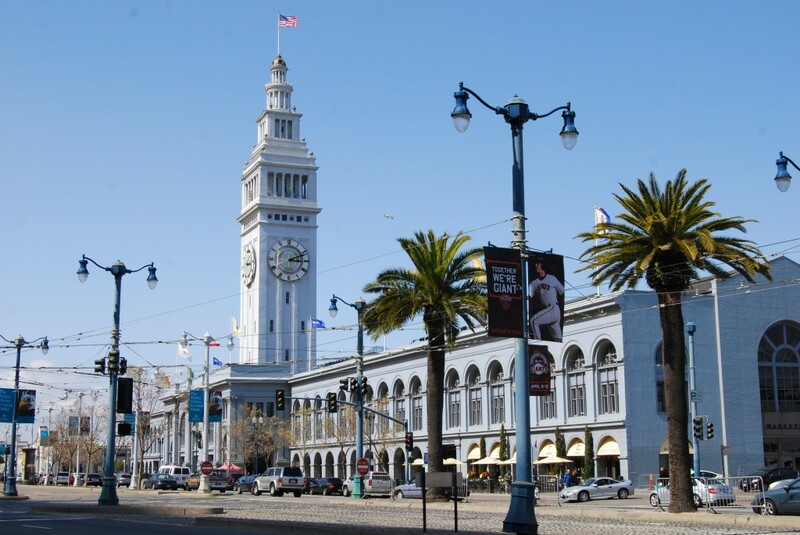 When the Embarcadero Freeway was demolished after the 1989 earthquake, opening up the harbour piers to the city centre, streetcar tracks were laid all the way from the Ferry Terminal, the focal point of the original cable-car and streetcar systems, past Pier 39 to Fisherman’s Wharf. The current F-Market & Wharves line is a fully functioning component of the city’s public transport, serving the suburb of Castro as well as the tourist honeypots downtown. There are plans to add a further E-Embarcadero line south from the Ferry Terminal and west beyond Fisherman’s Wharf. Most of the vehicles are the ubiquitous PCC cars, designed in the early 1930s and mass-produced until the 1950s, spacious, comfortable cars with impressive acceleration, painted in liveries from a range of American cities. There are also some older vehicles, Peter Witt cars, originally designed for Cleveland and successfully exported to Europe. These exceptionally noisy vehicles are from Milan, and still contain charming Italian notices inside – Vietato fumare, Vietato sputare, Uscita. And, on special occasions, a historic fleet is wheeled out, including a 1934 Blackpool open “Boat” tram. It’s ironic that, while San Francisco’s two successive light-rail fleets have been plagued by technical faults and remain far from popular with passengers, the seventy-year-old PCC cars and their older Peter Witt cousins trundle back and forth smoothly, fairly quietly and efficiently. For practical information about the F-Market & Wharves streetcar service, see http://sanfrancisco.about.com/od/munibart/ss/muniandmaps_9.htm, or to indulge your inner anorak look up the cars at http://www.streetcar.org/streetcars/. The latter site belongs to the San Francisco Railway Museum, which is about streetcars, not railways, and is to all practical purposes a shop: http://www.streetcar.org/museum/. This entry was posted in Exploring California, Life-enhancing experiences, Transports of Delight on December 29, 2013 by Mike Higginbottom. San Francisco is the city where “cable cars climb halfway to the stars”, and if you stand in the right place at night, they really do. That the cable cars are indelibly linked with the visitor’s image of San Francisco is the cause of, but not the reason for, their survival. The very first cable-hauled streetcars in the world, they were developed by a wire-rope manufacturer, Andrew Smith Hallidie (1836-1900), as an alternative to the inefficient and cruel horse-drawn streetcars that simply couldn’t cope with the city’s precipitous inclines. His first line, on Clay Street, opened in 1873. On the first run, the original gripman, a steam-locomotive driver (or – in American English – engineer) called Hewitt, lost his nerve at the brow of the hill, and resigned on the spot: the first car was driven by Hallidie himself. 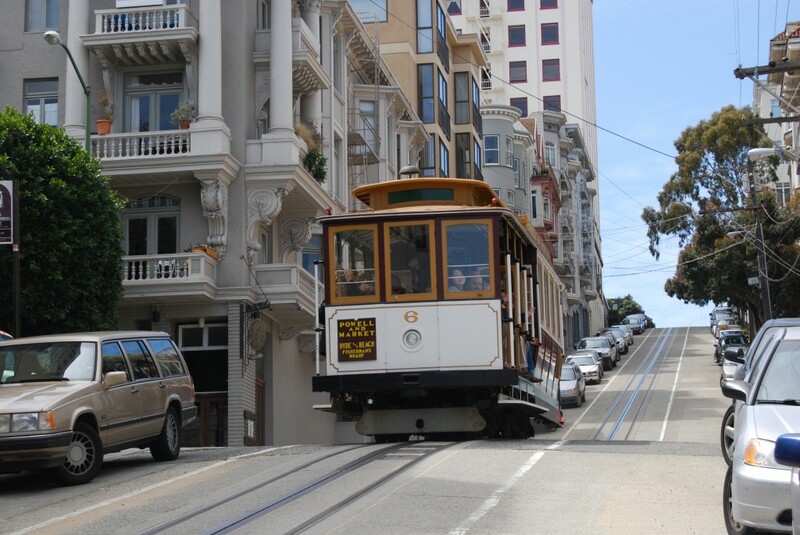 By 1894, 103 miles of cable-car track were in operation with a combined fleet of about five hundred cars. In the recovery from the 1906 earthquake and subsequent fire, several cable-car lines were converted to electric operation. Even so, electric streetcars were unequal to the 10% grades that cable-cars took in their slow but inexorable stride. Only rubber-tyred trolleybuses eventually stood a chance of competing. After the Second World War city politicians, supported by a powerful lobby of oil, rubber and motor-vehicle interests, aimed to close down the five surviving lines, but were ultimately defeated by the sheer weight of public-opinion. In 1956 three remaining routes, comprising nine track-miles, gained legal protection by popular demand. The system was designated a National Landmark in November 1964, and when it finally wore out was completely rebuilt in 1982-4. To a modern eye the cars look absurd, but when you climb aboard they immediately make sense. Because they attach to an underground cable running at a constant speed of 9½ miles per hour, they tackle the steepest inclines with as much equanimity as dead level, and crawl downgrade as steadily. Riding the cable cars is an experience for the early morning: after about 9.30am the crush is such that all you see sitting inside is buttocks. Outside your view is often blocked by passengers standing on the running board. There is a practical alternative to being crushed on a cable car. San Francisco is festooned with trolleybus routes, operated by surprisingly noisy single-deck vehicles, some of them articulated. They’re spacious, speedy, and effective as urban transport. I learned years ago, when I bought a plastic salad spinner to dry lettuce, that the moaning sound I remember Sheffield trams making when I was a kid, which is also distinctive of the London Underground, is not in fact the electric motors but the gears. The single-deck San Francisco trolleybuses, with their long trolley booms, also make a distinctive slapping noise overhead as they progress through junctions. They’re nowhere near as noisy as the cable cars, though. And totally clean, unlike their diesel cousins. $29 buys a seven-day Muni Passport (or $23 for three days, $15 for one – prices from January 1st 2014) – a real bargain giving access to cable-cars, streetcars, Muni Metro light-rapid transit, trolleybuses and motor buses across the city area. They’re not valid on BART [Bay Area Rapid Transit] or airport shuttles. See http://www.sfmta.com/cms/mfares/passports.htm for further details. There’s no shortage of good food in San Francisco. All you need do is avoid obvious tourist traps and eat where the locals eat. If you ride the F-line all the way to its Castro terminus, you more or less fall into Orphan Andy’s, within yards of the streetcar terminus, where I ate a classic burger and fries for a little over $10, including a properly made pot of English Teatime tea. Another time I tried the memorably named and nearby Squat & Gobble [http://www.squatandgobble.com] which offered good food (corned beef toasted sandwich) at a very reasonable price served with wit and panache. If I lived in Castro I’d go there for brunch. It turns out that there’s a London branch of Squat & Gobble on Charlotte Street in Fitzrovia (ie, near the Post Office Tower): the menu looks thoroughly English rather than a Californian import. I wouldn’t wear the T-shirt, though. I ate Kobe (having first had to ask what it was) at the Market Bar [http://www.marketbar.com], at the magnificent Ferry Terminal on the Embarcadero. Kobe, so Juan Carlo the waiter told me, is a special breed of cattle which the Japanese raise in idle luxury so that the animal does not develop much muscle: apparently, they also massage the animal’s buttocks (while it’s still alive). Once dead it is indeed exceptionally tender. Wikipedia tells me [http://en.wikipedia.org/wiki/Kobe_beef] that Kobe beef is from the black Tajima-ushi breed of Wagyu cattle, though in the USA it is usually crossbred with Angus to suit the American taste for darker meat. Market Bar is a splendid lunch venue for people-watching and listening, in my case to a ball-busting lady executive laying into a male colleage in high-pitched staccato: when she left it was, as my Yorkshire friends say, “like t’mill stoppin'”. The restrooms are a long walk across the food hall, however: when I nipped out to take precautions during a kitchen delay, an over-zealous waiter cleared my table and had to lay it again, to his embarrassment. I also fancied, but did not have time to try, Butterfly [http://www.butterflysf.com] at Pier 33 on the Embarcadero, right next to the Alcatraz Cruise terminal. This is not a recommendation, but a suggested alternative to the perfunctory, cheap and cheerful Alcatraz Landing Café, where I dined with a persistent pigeon that resisted the waitress’s attempts to drive it out with a water-pistol. My adviser about Italian food in San Francisco, John Rozatti, recommended I eat at the Molinari Delicatessen [http://maps.google.ca/maps/place?oe=UTF-8&ie=UTF8&q=molinari+deli+san+francisco&fb=1&gl=ca&hq=molinari+deli&hnear=San+Francisco,+CA,+USA&cid=15255183613653254552&z=14] on Columbus Avenue. When I went looking for it, after dark, I missed it because it closes at 5.30pm and I ended up instead people-watching in the front window of Pinocchio [http://www.trattoriapinocchio.com/about.html], eating an excellent fettucine con salmone with a glass of Montepulciano, an attractive red wine I hadn’t previously heard of. John would no doubt still vote for Molinari: he says, “order a number 8 (Renzo’s Special – request imported meat). You will leave there (1) content and (2) full.” I trust John: he has Italian ancestry and a sister who lives in San Francisco. This entry was posted in Exploring California, Life-enhancing experiences on December 29, 2013 by Mike Higginbottom.